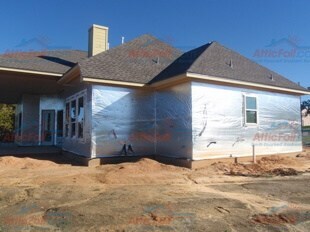 Click to see photos of AtticFoil™ House Wrap installed. Home builders are starting to use AtticFoil™ instead of Tyvek® as a house wrap because not only is it easier to work with than a single roll of Tyvek® (and performs similarly) but it also gives homeowners the added benefit of blocking radiant heat! With the advancement of new wall systems, there is no need for a traditional house wrap since the air and water barriers are now included in the exterior sheathing. The perforated foil allows moisture to escape and dry out through the perforations, while the product still acts like an air barrier and a drainage plane to stop liquid water from passing through. Our foil house wrap offers good vapor moisture permeability, good air infiltration protection, a secondary drainage plane, and a radiant barrier all for less than the cost of typical house wraps! View our photo gallery of AtticFoil™ house wrap installs here. Our 60″ wide house wrap product does a wall with a single seam! All of our foils reflect 97% of the radiant heat hitting your exterior walls. Click Here For Pricing on our 60″ wide house wrap. To use AtticFoil™ as a house wrap when you have brick or stone exterior, you would install the radiant barrier closest to the outside sheathing, while still allowing for an air gap. With brick or stone this air gap is usually a naturally occurring thing, so for the purpose of this explanation we will assume the air gap is naturally occurring. 1. Start at the bottom and staple the foil to the walls. 2. Finish with your second (or third) run as you work your way to the roof overhang. 3. Go back and use foil tape to close the seams; the tape helps seal up the application and make it air tight. 4. Finish by applying your exterior veneer (brick or stone in this case) and the project is complete. Now you have full coverage, for maximum heat rejection on all walls exposed to radiant heat. With the house wrap product, remember it is important to have the foil facing out/toward you (as in the photos) so the aluminum is open to the air gap, this is crucial for any radiant barrier since radiant heat does not exist outside of an air gap/space. If you’re using the double-sided foil, then it doesn’t matter which way the foil faces. Have a stucco home? 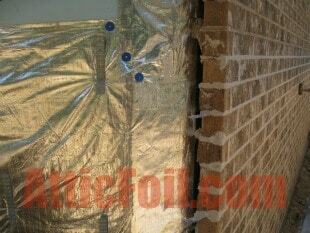 Because there is no air gap on the exterior, we recommend installing the foil inside the exterior walls as shown here.